[PfP] First Auction Goes Live! Velmarius is up for auction! The auction will run for only a week, so bid soon before you miss your chance! For Velmarius, I’m trying to appeal to the gamer crows as well as the show piece crowd, so I need a base that both looks good and is visually interesting, and that’s practical for use in a game. Thus, I’m going to use the 1-inch square base that the model came with, and I’m going to base it in a dungeon floor type theme. Lots of time spent at the desk this weekend, and only a little bit of it spent playing video games. Progress has been made primarily on Velmarius and the Ember Mage, with just a little bit of clean up on the Tau Battlesuit (fixing overspray). Let’s start with the Ember Mage. Mostly, the gem in the staff is done. It’s P3 Thamar Black at the top, P3 Beaten Purple in the middle, 50/50 Beaten Purple and P3 Arcane Blue as it gets lighter, and then 50/50 the previous mixture and P3 Morrow White at the very bottom. Two dots up top, one big and one small are also Morrow White. Additionally, while I had the black and white out, I painted her open mouth and teeth. 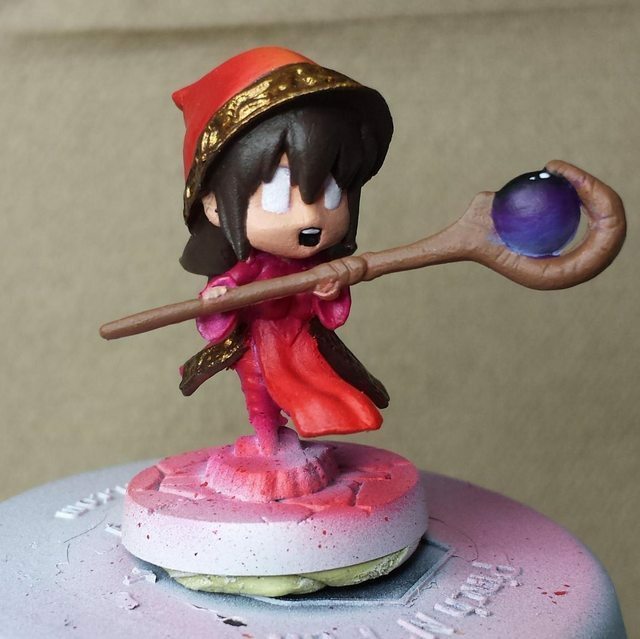 For whatever reason, of the models I’ve prepped the Ember Mage struck a chord and got the most attention. Here’s a quick update, after perhaps an hour of brush basecoating and just a little 2-brush on the hat’s rim. I’ve been painting privateer Press models for quite a while now, and painting the Viking Girl for Meg’s class a few months ago was a real joy. I was happier painting that model than I’ve been while painting for a long time.